Sam, you’re a EE who co-founded a company. Tell us about Podo Labs. 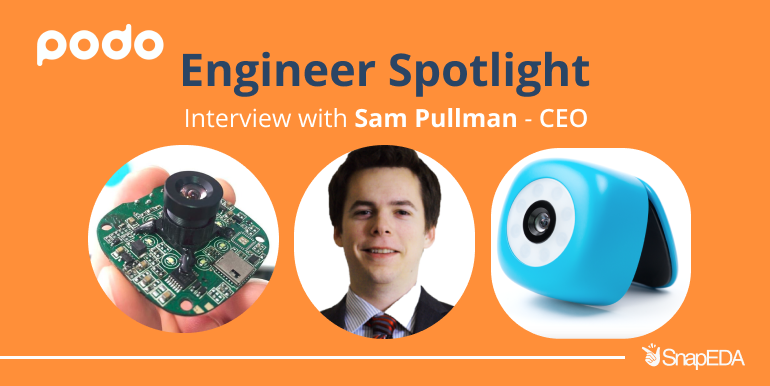 Sam: We design, develop, and market electronic products that are unique or exciting to us. We have a small team that takes pride in our ability to execute well on all aspects of the product cycle. Sam: Our CEO Jae and President Eddie Lee reached out to me just after I graduated, we all went to UC Berkeley. Our first project was actually an iOS/Android app, which received a small amount of funding via the Plug and Play Startup Accelerator in Sunnyvale. We switched to a hardware project (the first Podo camera) at the urging of an advisor and some inspiration from Eddie, and have been making electronic products ever since. What is the most interesting technical aspect about the Podo Labs? Sam: The Bluetooth host stack we used in both Podo cameras was written entirely from scratch in-house. We chose Bluetooth because, back then, WiFi direct wasn’t well supported – connecting took a long time and there was significant latency. However, none of the Bluetooth stacks we surveyed had both the necessary application throughput and Apple MFi compatibility, so we made our own. KiCAD has improved a ton in the last few years, and is more than capable of producing a professional PCB design. Which tools do you use for circuit board design, and why? Sam: We used Cadence OrCAD/Allegro for our cameras, but now prefer KiCAD. KiCAD has improved a ton in the last few years, and is more than capable of producing a professional PCB design. For really complicated designs we would still probably use Allegro or Altium. Our EE colleague says the KiCAD layout tools (autorouting, push & shove routing, trace impedance stuff, etc) aren’t quite up to par. Do you do schematic, layout, or both? Sam: We do both in house, but these days I personally just handle part selection, design reviews and BOM/supply chain management. Do you use 3D in your PCB layout? Sam: Yes, our industrial designer (ID) makes 3D models of the components, the PCB designer integrates them, then passes the final 3D model back to the ID. We use that to check for mechanical interference, and look for possible component placement optimizations. What do you wish a company made that would make the designing process more efficient? Sam: Better software compatibility for 3D/PCB/etc., cheaper high precision 3D printing, and an embedded firmware IDE that doesn’t feel like it’s from the dark ages. Do you have any words of wisdom for EEs, or those wishing to pursue a career in our industry? Sam: Learn KiCAD! It’s open source, far better and more complete than any other free PCB software, and only takes a day or two to get familiar enough to build a simple project. Also, most of the concepts and techniques transfer over to the common proprietary CAD software. Tools like Arduino, Mbed, Raspberry Pi, etc. are great for rapid prototyping, but don’t be afraid of custom PCBs. With Digikey and Seeed studio or similar, you can throw together a simple dev board in just a week or two. Where can someone acquire your products? Sam: The Podo camera can currently be purchased at https://store.podolabs.com/ and our Bluetooth audio adapter and speaker will be available there at some point. How do you think the camera, speakers and headphone industry will look like in 10 years? I’m really interested to see if VR takes off. If it does I think there will be a lot of development in the area of VR content production. Sam: Phone and action cameras will continue to improve incrementally, and both markets will remain steady. At some point somebody will make a successful live streaming camera, and in-home video chat focused camera. The drone camera market will saturate, if it hasn’t already. I’m really interested to see if VR takes off. If it does I think there will be a lot of development in the area of VR content production. I don’t think the speaker industry has changed much in the last 30 years besides adding Bluetooth/WiFi, and focusing on smaller drivers for portability. I imagine that trend will continue, although rare earth magnet scarcity could be the impetus for some sort of innovation. Most non-high-end headphones will use Bluetooth. Battery life will improve, and hopefully, noise cancellation or other interesting software improvements will make it in to lower cost headphones. Sam: During the product design phase, it would have to be the excitement of architecting a product that thousands of people will use and (hopefully) enjoy. Otherwise, keeping the alarm just out of reach works fine. During the product design phase, it would have to be the excitement of architecting a product that thousands of people will use and (hopefully) enjoy. 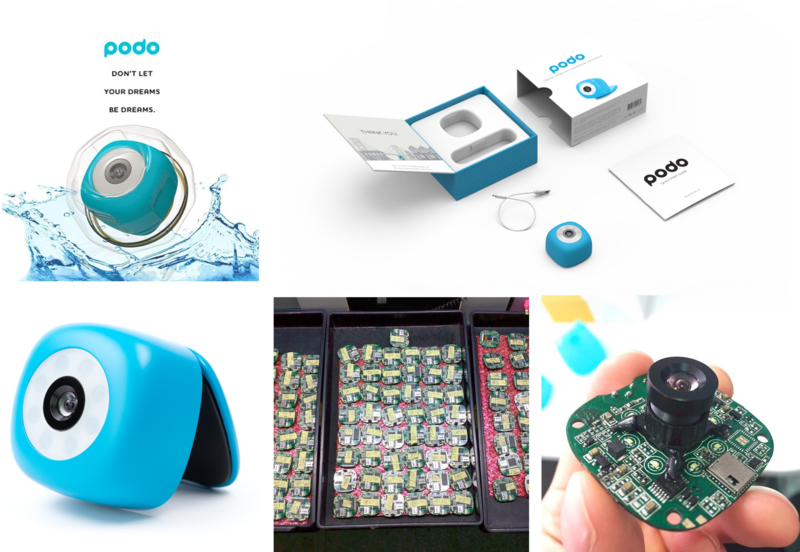 Sam: Feel free to reach to hello@podolabs.com for help with product development, Kickstarter, or anything else! We’re happy to provide advice, or engage in contract work if it’s a good fit for both parties.